Relax in Sussex with Horsham T'ai chi & Reiki. Clear emotional and physical blocks to maintain a balanced Mind, Body, And Spirit Relax in Sussex with Horsham T'ai chi & Reiki. About Tensho Chi. New ways to beat stress are always welcome. One way, if you live in or hear Horsham in Sussex, is to learn Tensho Chi. This originated from Chinese Kempo and is possibly one of the oldest martial art forms. It concentrates on deep slow intakes of breath and slow exhalation. These movements create an increase in our internal body energy (Chi in Chinese). Using this energy (Chi) to help the body heal itself it increases the Chi to the different organs of the body . Chi is able to move round the body the joints become free from stress, the stomach relaxes, the legs become stronger and the feet provide a connection with the earth. By practising this form with various other slow exercises including still meditation it allows the mind and body to be totally relaxed and re-energised which implements better Health. Creative visualisation is active. Meditation is passive. Means of gathering energy. Working with Creative mind. A natural power of imagination. Thought is energy that sets everything in motion.. Energy follows thought. Where do we derive our Life Force from? The basic source of human energy, according to Taoists, comes from our parents. The Yin energy of the mother in the egg and the yang energy of the father in the sperm provide the initial sparks that ignite the fire of life. This energy from the parents is called prenatal energy or original Chi. A second source of Chi is radiation from the stars in the form of light, electromagnetic waves, and subsonic vibrations. The most prominent stars in this process are the Sun and the North Star in the constellation known as the Big Dipper. Humans in particular depend on the Chi, which is radiated through space by the stars and planets, for sustenance. The air we breathe is charged with cosmic energy in the form of extremely fine particles of cosmic "dust". This dust is the residue of exploded stars, planets and asteroids. It rains constantly onto the earth forming as essential component of the soil. Plants are the only living organisms that can directly transform light into nourishment. Humans absorb light energy indirectly by eating either vegetables or the flesh of other animals that feed on plants. The interaction of light, cosmic dust in the soil and air, together with water, forms the basis of photosynthesis in plants. Chi is life, and abundant energy is abundant life. If our energy supply is low due to illness or excessive emotions, we experience low vitality and lack of drive. Living ceases to be an enjoyable experience; we feel disconnected, leading to the feeling of being separated from the environment, from society, and from ourselves. Taoists therefore place extreme importance on cultivating and maintaining a high level of energy to strengthen ones connection with the universe and oneself. Tensho-Chi with its emphasis on breathing and movement from the chest and from the centre of the body, helps to build and distribute the vital energy, by strengthening the function of the stomach, spleen and the lungs. These are the organs most responsible for receiving and processing the external Chi of food and air. Tensho-Chi teaches you to stand and move naturally and breathe from the belly rather than the chest, allowing the Chi to circulate freely. In Tensho Chi you deliberately use your own awareness or intention to direct your energy and guide your body and mind to a state of spontaneity and a natural way of movement. In Tensho-Chi we focus on the most minute details of how we move, breathe and use our mental intention. With regular practice, this awareness begins to spill over into daily life. Through this increased awareness in practice, the dangers of ordinary life, injuries, mistakes and accidents are greatly reduced. Below is a guide to what Tensho-Chi is and how we practice it. Tensho Chi is an ancient form of health - exercise developed by the northern Shaolin system of Chinese martial arts. Due to the philosophical, social, economic and cultural exchanges made between China and Japan throughout the centuries, particular impressions have been left upon each nation's psyche. For Japan, because of their natural militaristic inclination, the legacy of the Chinese martial arts system was easily absorbed, and later redeveloped. It is no wonder that today in Japan we find considerable Chinese influence in the 'forms' of these Budo arts. Within the Nahate system (Goju-Ryu style) of Okinawa Karate is found a 'Kata' by the name of 'Tensho', which uses a strong stance and tension breathing techniques. The similarity of this form to the ones presented here is only slight, but they may very well have had a common origin. Within the system of Tensho-Chi there are twenty four variations to the form, each one with its own benefits. These affect the body's natural energy (Chi). Around these versions of Tensho we have the fortunate use of a wide range of self-awareness or body informing techniques. The Tensho Chi system could easily be called 'Tensho-Chi-Kung'. It is in fact an internal energy discipline using breathing, meditation and posture exercises (both active and static) to encourage the 'free-flow' of natural energy (Chi) around the body, thus opening or unblocking the etheric pathways or meridians of the body. The purpose of these exercises is to create, eventually, a physical-emotional-mental alignment, the result of which is 'health' or 'wholeness' in the fullest sense. The whole system of Tensho Chi consists of 24 Katas each one with its own particular style or feeling. There is also the energy side of the system which is being aware of the Chi in each form and also being aware of the Chi around other students. This then leads on to the universal Chi through exercises. Another part of the system is the meditation side of Tensho-Chi which is being aware of ones own mind which is a very powerful tool when cultivating the workings of Chi. This leads on to the Martial Arts side of each form. The application of each Kata is taught and practiced slowly. With the help of a partner each student is able to practice each movement, experiencing the flow of Chi. Within these exercises pushing hands is also practiced. 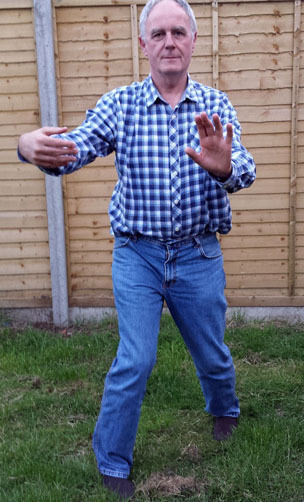 "My weekly Tai Chi session is my 'oasis' of calmness. The gentle exercise helps me feel grounded and relaxed and by the end of the class I feel energised for whatever lies ahead. Paul is calm, patient and very knowledgeable teacher and his friendly class is a pleasure to attend."